On paper, The Horse Boy sounds almost unbearable. 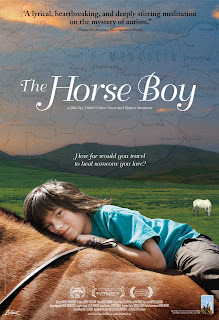 It's a documentary about a family with a severely autistic son who discover that he seems to have a unique connection to horses, and set off to Mongolia where horses are a major part of the culture and shamanic traditions are still very strong, in hopes that young Rowan can be helped, or even cured. It has all the outward ingredients of a sappy, manipulative melodrama, a kind of "Ma and Pa Hippie Go to Mongolia" vibe. The final product, however, is surprisingly compelling. It does occasionally dip into sentimentality - the use of banal pop songs to back up the more emotional moments tend to pull the audience out of the moment rather than the other way around - but overall the film manages to keep its head above outright mawkishness. 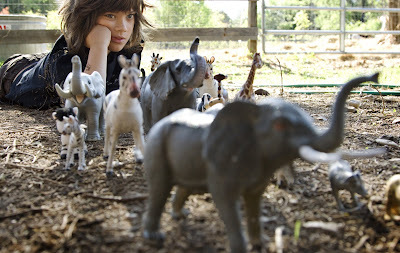 That's probably thanks to co-director Michel Orion Scott, whose fellow director, Rupert Isaacson, is the boy's father. Scott's more objective eye balances out Isaacson's more direct emotionalism, making for a more stable viewing experience. While I'm still skeptical of the credibility of the shamans and their very specific set of traditions and superstitions, watching them work and seeing their remarkable effect on Rowan is both fascinating and, yes, moving. Isaacson's introspection and fatherly hand-wringing alternates between poignant and grating, to the point that I think the film would have been better served with less narration and more of letting the action speak for itself. The main narrative is intercut with interviews from doctors and autism experts, which shed light on the often misunderstood condition. It provides a backbone for the story we are watching, and in some ways helps us to appreciate the massive hurdles this family faces. I feel like the filmmakers were trying to evoke a feeling similar to The Story of the Weeping Camel, a far superior documentary set in Mongolia that culminated in a miraculous and touching cure. While The Horse Boy never quite attains the stature of that film, it remains an illuminating and intimate look at condition few people know anything about, that in less severe cases can even be considered a good thing. It may not break any new ground in the documentary department, but it's a mildly successful middle of the road effort that comes by its tears honestly. THE HORSE BOY; Directed by Michel Orion Scott, Rupert Isaacson, Not Rated.